History: Chapter XIII was organized by Mrs. Hale Houts. The chapter’s charter was granted on April 15, 1949. Chapter Project: Chapter XIII supports The Wornall Majors House Museums in Kansas City, Missouri. 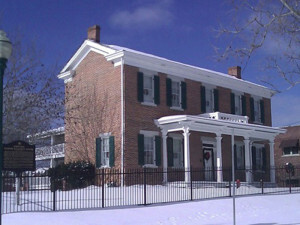 The museum consists of two historic antebellum homes. Chapter XIII restored and furnished the Master Bedroom of the Wornall House. The Wornall House, built is 1858, is interpreted to represent a wealthy household in antebellum Missouri. In the past, Chapter XIII has also supported the Harris-Kearney House in Westport, Missouri, which houses the Westport Historical Society. The house was completed in 1855 and is the oldest brick residence in the city, with much local significance in the history of Kansas City. Chapter XIII furnished the South Bedroom in the house, circa 1875.